Hello Everyone! I am so excited to be here to share a new stamp company, with a new stamp release, with you today! Create A Smile is a new stamp company in town - their first stamps were released in July 2014. The stamps are made of high quality photo-polymer and produced in Germany. They will for sure make you smile! I used digital images that Christine Drogt, the owner and designer of Create a Smile, sent to me. They may be off a little in size as I did use a digital image. I tried my best to get them to be true to size. I love this little train set. I added a third car to it. I wanted one to hold the sentiment and another to hold the hearts. I drew in the train tracks with a black fine point pen and highlighted it with a silver colored pencil. I masked off the car before stamping some hearts into it (the hearts aren't in the set sorry), I added some waterfall stickles to those adorable puffs of smoke. I also resized those in photoshop. Isn't this set just adorable? Wouldn't you LOVE to WIN a set? You can win a 12,50€ gift-certificate for the Create A Smile store - all you need to do is hop along and leave comments on all the fantastic and inspiring stops (one comment per person, per blog please!). We’ll pick random winner from all the comments - so the more blogs you visit (and leave a comment on) - the more chances you have to be a winner! Now hop on over to the very talented Samantha Mann. At any time during the hop that you get lost or find a broken link the list is below. Such a cute card, love the colours you used. I love how you filled the back of the train with hearts. Adorable. 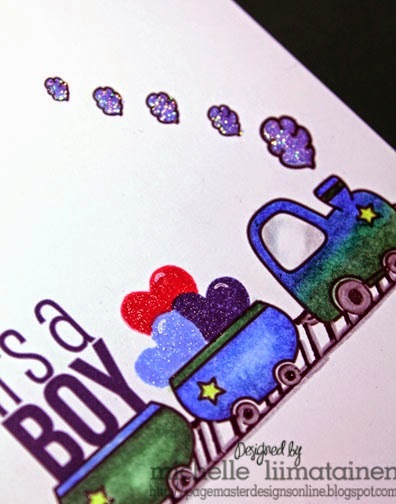 Love your colourful train image, a sweet card. Lovely card, I love the Pop od red. I love how you've used the train set holding the sentiments and hearts! great work. Wow love your card how cute are those hearts!!!!! Glad to have you joining our bloghop. This train is soooo cute!!!! Love your colouring in shades of blue and green, amazing! Oh my word this is so cute and colorful!! I adore your gradient colors on the train! :) Thanks for sharing! What a clever and cute card! Very nicely done. 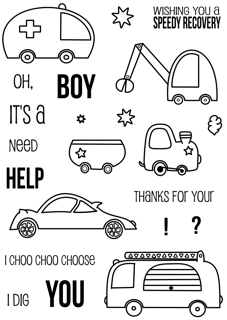 Love the added stickles and the blue-green train and coal cars. So so cool! Loving the added shimmer! What a cute little card! I love the colours. 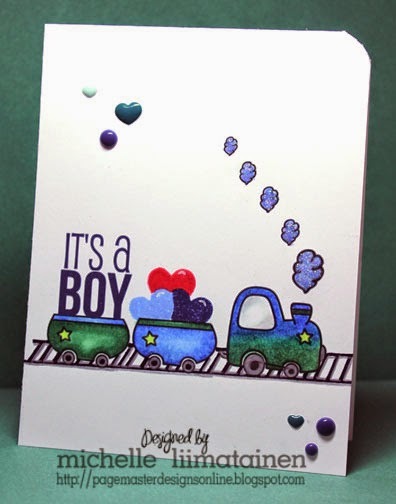 Such a cute baby boy card! Love that train!